A little piece of heaven on Earth, Everlasting Caress is a romantic design brimming with stargazers and hydrangeas. Send this for a special anniversary treat, birthday or a lovely surprise on Mother's Day. 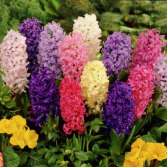 Fragrant spring hyacinths. Available in several colors. Blue/purple, pink and white. Delivered with a festive Bow. 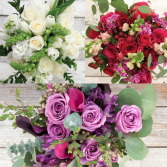 Choose from any of these style bouquets. An elgant all white and green bouquet of seasonal flowers. A rich red with pinks and purples, or a softer feminine lavender and pink bouquet. 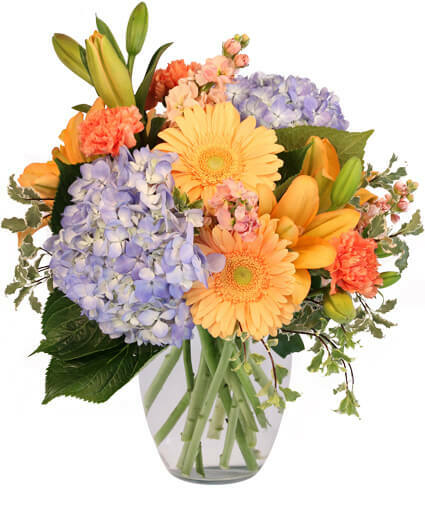 All beautifully arranged by our florist and accented with wildflowers and interesting foliages. All come hand-tied and “vase ready”. Specify, white, red or lavender in the comments.